My Story card: Tilly Abraham remembers performing in 'The Pirates of Penzance'. 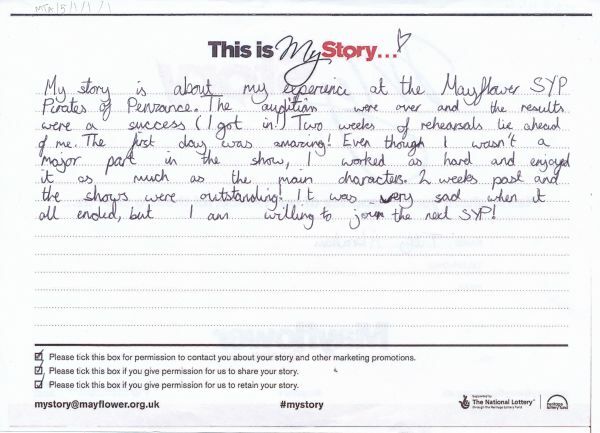 My story is about my experience at the Mayflower SYP Pirates of Penzance. The auditions were over and the results were a success. (I got in!) Two weeks of rehearsals lie ahead of me. The first day was amazing! Even though I wasn't a major part in the show, I worked as hard and enjoyed it as much as the main characters. Two weeks passed and the shows were outstanding! It was very sad when it all ended, but I am willing to join the next SYP!